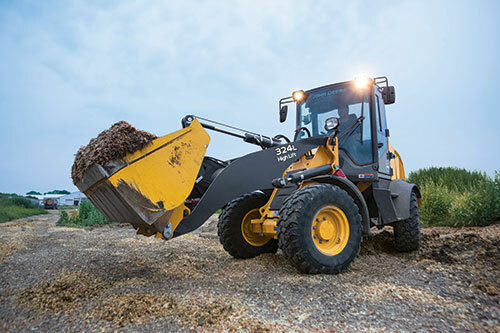 John Deere redesigned its K-Series compact wheel loader models with the introduction of the 244L and 324L compact wheel loaders. Ideal for landscape/snow removal, ag material handling and construction tasks, the new models round out the full line of L-Series compact wheel loaders available from John Deere. The Articulation Plus steering system on the 244L and 324L provides operators lift capacity and maneuverability. This feature includes an articulated frame plus rear-wheel steer, providing full-turn tip load and stability with a tight turning radius. Newly optimized linkage provides improved parallel lifting, with only 6 degrees of rollback. The 244L achieves an 8-foot, 3-inch full-lift dump height and a full-turn tip load of 8,157 pounds, while the 324L with high lift reaches a 10-foot, 3-inch height, and standard lift is capable of a full-turn top load of 9,766 pounds. A smooth autoshift hydrostatic transmission is coupled with an automatic two-speed gearbox, which provides a faster travel speed of up to 23 mph—a 21 percent increase in speed over the K-Series models, the company said. Both models are equipped with 73-hp Final Tier 4 engines. The 244L and 324L models offer a redesigned cab. An optional air ride, high-back operator seat ensures a smooth ride. For greater uptime, a rear enclosure provides better debris management, while a revamped cooling package improves air flow. To keep operating costs at a minimum, rim pull control extends tire life by allowing customers to adjust the torque of the machine to the conditions of their job sites, saving tire and driveline life. Additionally, optional JDLink telematics provides real-time data and health prognostics to suggest maintenance solutions that decrease downtime. Remote diagnostics enable a dealer to read codes, record performance data and update software without a trip to the job site. These new models are also backed by the John Deere full machine standard warranty, which promises to fix any defects in materials or workmanship for two years after delivery or 2,000 hours—whichever comes first.